pt Health is proud to team up with the Arthritis Society to be their National Physiotherapy Champion. As healthcare professionals, we share the Arthritis Society’s mission to help people affected by arthritis advocate for themselves, find and get the best treatments available, and have the highest quality of life possible. In order to support us in this mission, pt Health clinicians in Ontario will also have the opportunity to leverage the expertise of Arthritis Society therapists in the Arthritis Rehabilitation and Education Program. Osteoarthritis (OA), also called degenerative arthritis, is a degenerative joint disease that can affect any joint in the body. It occurs when the cushioning cartilage between the joints breaks down and becomes rough, and causes affected joints to feel sore, achy, and stiff. In a normally functioning joint, cartilage (the firm, rubbery material that covers the end of each bone) acts as a smooth barrier between the two meeting joints allowing the joints to glide smoothly. As OA is a degenerative joint disease, the longer it goes untreated, the more it progresses to later stages. As the disease progresses and the cartilage is worn away, the bones will begin to rub against each other, causing them to break down and produce growths called bone spurs. Physiotherapy can be an effective treatment for osteoarthritis and can prevent progression to later stages. If you’re seeking physiotherapy for symptoms of osteoarthritis, find a clinic near you and book an assessment today. OA can strike any joint in the body, causing pain, stiffness, swelling, and a grinding sensation called crepitus. 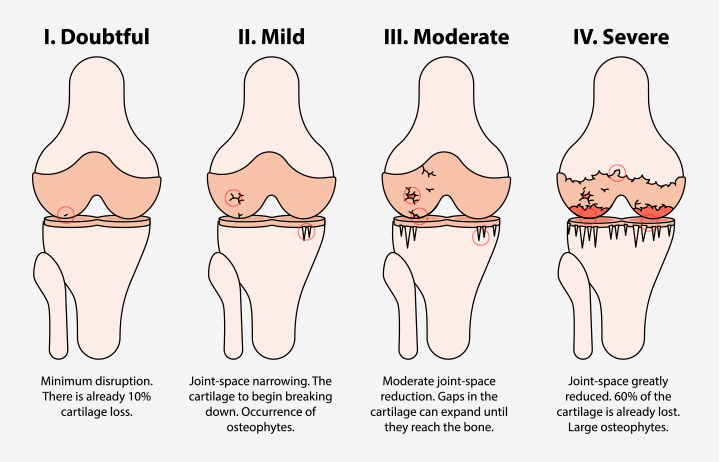 Signs, symptoms, and early indicators of osteoarthritis vary depending on the affected joint and how far the disease has progressed. Osteoarthritis can make it difficult to do everyday tasks like walking up or down stairs, getting out of cars, playing guitar or other fine motor skill tasks, and can also make sleeping uncomfortable. Physiotherapists are trained to do a full assessment of your physical abilities, based on the findings of a detailed examination. They note the degree of pain, swelling and discomfort you have in the affected joints, as well as how much strength, flexibility and range of motion exists in both healthy and arthritic joints. A physiotherapist can develop an individualized program that is designed to help you increase your strength, flexibility, range of motion, general mobility and exercise tolerance through a wide variety of therapeutic treatments and interventions. These include exercise prescription and physical modalities in addition to advising you on other techniques for reducing pain and increasing your overall quality of life. 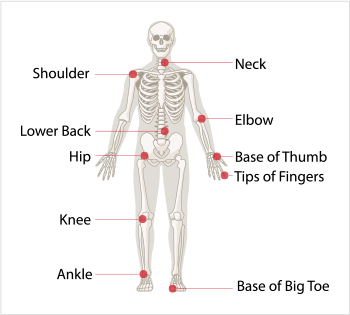 Find a clinic near you and book an assessment for osteoarthritis today. While there is no known cure for osteoarthritis, physiotherapy is a safe and effective way to help reduce the burden it can bring by helping to mitigate symptoms, slow joint deterioration and improve mobility. Don’t let pain hold you back from doing the activities you love. Book an assessment for osteoarthritis and speak to a physiotherapist today about the best treatment options for you. Our partnership with the Arthritis Society allows all pt Health clinicians to gain even more valuable insight into both osteoarthritis and rheumatoid arthritis, with additional learning from the Getting a Grip on Osteoarthritis and Getting a Grip on Rheumatoid Arthritis programs. Are you concerned about signs & symptoms of osteoarthritis, a recent diagnosis, or risk factors in you or a loved one? Book a physiotherapy assessment today. Most extended health benefits plans cover the cost of physiotherapy for osteoarthritis. We offer direct billing to most major insurance companies and take care of the paperwork for you too. Coverage for physiotherapy treatment of osteoarthritis is available in both the Calgary region and Edmonton region under the Alberta Health Care Insurance Plan (AHCIP), also known as Alberta Health Services or AHS. Coverage for physiotherapy is available for BC residents that qualify for Supplementary Benefits under the British Columbia Media Services Plan. If you have osteoarthritis of the hip, knee, ankle, foot, wrist or hand, you may be eligible for The OsteoArthritis Service Integration System (OASIS), a referral based admission program. Learn more about the OASIS application process here. Unfortunately, there is no provincial coverage for physiotherapy under New Brunswick Medicare, except for physiotherapy services delivered in a hospital. Nova Scotia MSI does not cover the cost of any paramedical services, including physiotherapy, unless it is performed in a hospital. As of 2013, OHIP does not cover the cost of physiotherapy treatments for chronic conditions. As osteoarthritis is a chronic condition, it is not eligible for OHIP funded physiotherapy at this time. For more details and information about accessing OHIP funded physiotherapy, please visit our page on OHIP & physiotherapy services. If you’re concerned about symptoms, a recent diagnosis, or risk factors in you or a loved one and want to learn about how physiotherapy can help, book an assessment today.